Addicted 2 Novels: In My Mailbox (#15) with Keenan! 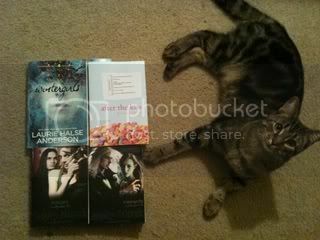 And this week, my kitten Keenan wanted to help present the books. So here we go! Special thanks to Around The World Tours. Great books! I've heard Wintergirls is amazing so I hope you enjoy it! So cute! I should have my little hamster (Hamchee) help me out next round of pics I take! I have to say I really like the new covers for Black's books! Keenan is so adorable with those fabulous looking books! Awh, it's Keenan!! Soooo adorable. Of course! Has to follow in his namesake's footsteps. Keenan...he's such an attention whore, lol. But ya gotta love that adorable face!